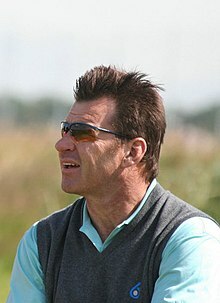 Sir Nicholas Alexander Faldo, MBE (born 18 July 1957) is an English professional golfer who is now mainly an on-air golf analyst. A top player of his era, renowned for his single-minded dedication to the game, he was ranked No. 1 on the Official World Golf Ranking for a total of 97 weeks.